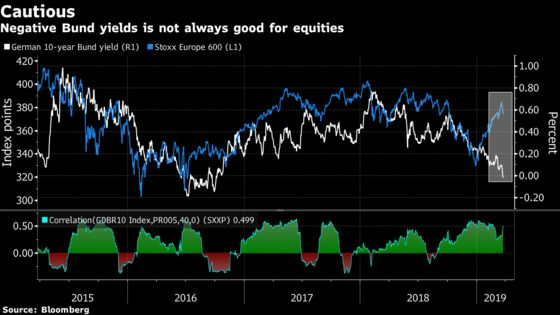 (Bloomberg) -- European stocks have entered their first real consolidation this year after weeks of gains. At the same time, Germany’s 10-year Bund yield retreated and turned negative for the first time since 2016. So we’re here again. 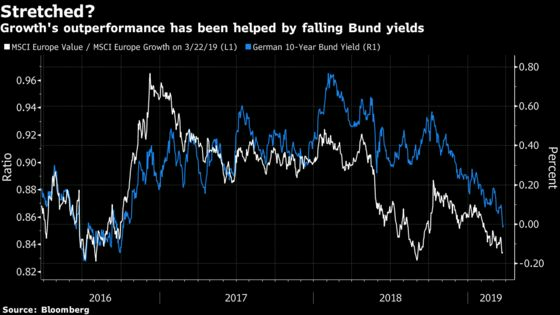 Europe’s economic picture has been deteriorating, pushing the yield over the edge, which has big consequences for European shares. As an investor, you have to find yield somewhere, and when government yields are consistently low, buying equities makes sense, especially those showing growth. Problems arise when the worsening environment casts doubt on earnings and sales growth. For Goldman Sachs strategists, while growth remains scarce, valuations for high-growth stocks now look very stretched. In fact, high-growth companies are trading at the biggest premium to low-growth stocks since 2000 in both the U.S. and in Europe, according to Goldman. The big positive feature for European stocks is their dividend yield. More than 80% of the region’s stocks are returning more than the average yield on corporate credit, and Goldman expects the share of total return coming from dividends to increase over time. German manufacturing data from last week is spurring concerns about a European recession and the possibility of the U.S. slapping more tariffs on Europe is making investors uneasy, Park said. In light of these factors, Brooks Macdonald cut its European stocks position this year to just 4 percent in balanced portfolios. Another general observation is that cyclicals tend to underperform defensives when bund yields fall. Cyclicals have been surprisingly resilient over the past month, so the question is: how long will this last if the bund yield stays negative? And, of course, there are the banks. Euro-area banks have a positive correlation of more than 0.4 to the bund yield. The sector bounced back in February but the enthusiasm was short-lived after the ECB and the Fed turned yet more dovish. And this might not be over: Central banks’ commitment to keeping rates lower for longer makes bond yields unlikely to move materially higher in the near future, according to Barclays economists. This means banks’ margins will remain under pressure. Depressed valuation levels could play in favor of banks though, as well as a consensus underweight toward the sector, which should limit the relative downside potential, Barclays says. 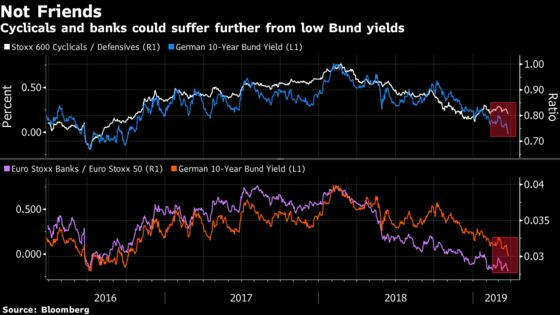 If you prefer a zero or negative correlation to bund yields, then you may want to look at the bond-proxy defensive sectors like utilities, food & beverage, real estate, personal goods and health care. They’ve started to outperform over the past five sessions. Ahead of the open, Euro Stoxx 50 futures are little changed. FTSE 100 futures are also flat, not much action here after The U.K. Parliament seized control of the Brexit process from May and will now seek to decide how Britain exits the European Union. Watch European semiconductors after Korean giant Samsung warned its 1Q results will fall short of expectations, but said it still sees a pick up in demand for memory chips emerging later in 2019. It didn’t really rattle many investors in Asia. Nevertheless, watch chipmakers like STMicroelectronics, Infineon and AMS and chip equipment firms ASML, ASM International and BE Semiconductor. Watch the pound and U.K. stocks after U.K. lawmakers decided to take control of Brexit, after the prime minster was forced to concede that there wasn’t enough support for her divorce agreement to bring it back to the House of Commons for a vote. Berenberg cut Zooplus to sell from hold, and halved its PT to EU60, as concerns about the company’s long-term business model have increased. The broker is not sure Zooplus will be able to overcome structural challenges facing European pet-food, and is concerned it may struggle to acquire high-quality customers because of more competition. Morgan Stanley said Sandvik is expected to see a material growth contraction this year, based on industrial data points and ’s MSCGi tracker. The broker cut rating to underweight from equal-weight, while new price target is set at SEK138 compared with previous SEK166. Berenberg sees a new wave of consolidation in the fertilizer industry. A deal between OCI and Yara (both rated buy) is “highly plausible” if OCI can sell its methanol unit and become a nitrogen fertilizers pure play. Expects Canada’s Nutrien (hold) to become an acquirer, but any large-scale deal is unlikely; initiates Mosaic at hold, keeps K+S at hold as discounts to peers reflect volume-related issues both potash firms have experienced.